1. You have too much work and not enough time. Success is yours! Everyone admires and appreciates you. You are in demand. Now you find yourself working until the wee hours night after night trying to get all the work done. This is the perfect time to get a raise—you are obviously worth it! If extra work is not worth extra money, it is not worth being done by you. If you are self-employed, you may lose a few clients when you increase your rates, but you will make up for that by making more money working fewer hours for the clients you retain. New Financial Stress Reduction® classes begin August 7 and 9! I treat money disorders – spending bulimia and income anorexia 🙂 Teaching people how to make more money and have more time off for fun is my passion! I’ve written three bestselling books, “The Wealthy Spirit”, “Zero to Zillionaire” and my latest, “From Worry to Wealthy”. 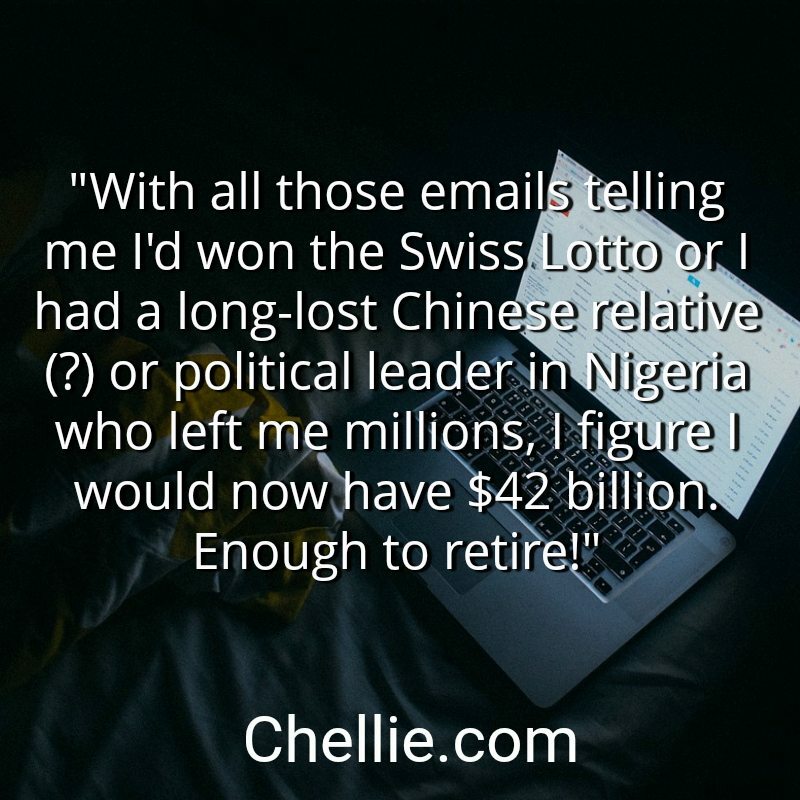 I have been fortunate enough to have heard from people around the world that it helped inspire them to go for their dreams and make the riches they deserve. For more than 25 years, I have been helping small business owners make huge leaps in their income and enjoy fabulous success and prosperity. A dentist in my class said he had more money at the end of class than he ever had in his life! 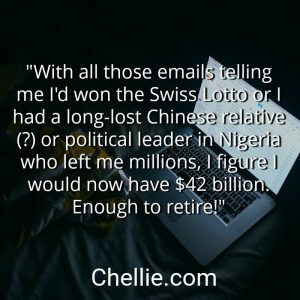 Details at http://www.chellie.com/financial-stress-reduction-telecourse-information/ then call Chellie for your discount coupon at 310-476-1622. My article on “Give Yourself a Raise” always gets a lot of responses. It’s because it addresses everyone’s fear about money. Most people believe the number one factor in buying decisions is price. That’s true for some things, but not all things. A woman named Connie wrote me to say: “What do you do when there are tons of people wanting to undercut the industry? Her husband quoted a certain amount for a construction job but then talked to someone in his industry “who gets top dollar for his work” and “upgraded his consciousness to a higher level, bid higher, but it just doesn’t fly”. Thanks for your email and story. I appreciate your taking the time to ask this question – it’s a good one. There’s a difference if you’re marketing the exact same “product” like a coffee mug – if it’s exactly the same coffee mug, a consumer wants the cheapest one. But with services, you want some qualities of being – I want the best coach, therapist, chiropractor, doctor, interior designer I can get and I understand the best isn’t going to be the cheapest. Services take time to deliver and that’s a finite resource – you’re going to run out of it. So if you’re selling time, you can charge more for your time the more experienced you are and the more popular you get. You can have two of the three but not all three: good and fast but not cheap, good and cheap but not fast, or fast and cheap but not good. Even with the top notch professionals, there are people who will bid on their services and ask for deep discounts or “match this bid” or try to tell you the going rate is “x” and you can’t charge more than that, etc. They are welcome to go elsewhere to shop; you don’t have to lower your price or your standards. This requires a certain fortitude and determination as it’s scary to turn down work when you’ve got bills to pay and the next paying client isn’t visible. Are there times when you will lower your price? Sure! Sometimes you’ve got to make an exception and do the next gig just because you need some dollars in the door now. But if this becomes your habit, you’re operating from fear instead of faith, and the Universe starts to think you just want “x” level jobs and starts sending those instead of the rich, wonderful, dolphin clients who praise you and pay you what you truly deserve. These clients may be fewer so you may have to do more marketing and selling to reach them in the numbers you need, but the payoff will be in a richer life. I hope that helps! Have a wonderful summer – wishing you many big treasure ships in your harbor!